On January 16, 2011 we received the attached letter from an UCLA Patient Business Service employee. The letter was sent as Anonymous to David Feinberg-CEO & Associate Vice Chancellor. I am writing this letter to inform you of the discontent that is present in the Patient Business Services Office under the directorship of Bernadette Lodge-Lemon, the management of Margarita Flores and Sureya Lopez-Monarrez As a tenured employee and one that reports to Margarita Flores and Sureya Lopez Monarrez in the past, I feel it necessary to inform you of the discord that the employees are feeling. My name will not be attached to this letter for reasons of possible management retribution. Let me begin by stating that I have seen managers come and go, but none as incapable as Margarita Flores who was brought here from Cedar-Sinai. Never could anyone have told me that our current management staff would be as it is today in these departments. I will begin by saying that Margarita Flores has been here a little more than two years. The following are instances where she was seen to have acted inappropriately and unprofessionally in situations that could have become volatile. Instance number one, Margarita had instigated a confrontation between two of her female employees, one of whom has since resigned, the other remains an active employee, both of these women were written up after the incident. She has had an issue that escalated between her and another employee go as far as the director (Bernadette). In the first incident these two women were called into Margarita’s office and faced each other with accusations that Margarita instigated between the two, it reached the point where both were very loud, and those of us in the outside cubicles became very concerned, although Margarita was heard a few times interjecting but the point being is that this situation could have become very dangerous in these times of violence in the workplace. We were all concerned yet knew this situation was not addressed in the professional managerial manner which was workplace appropriate. 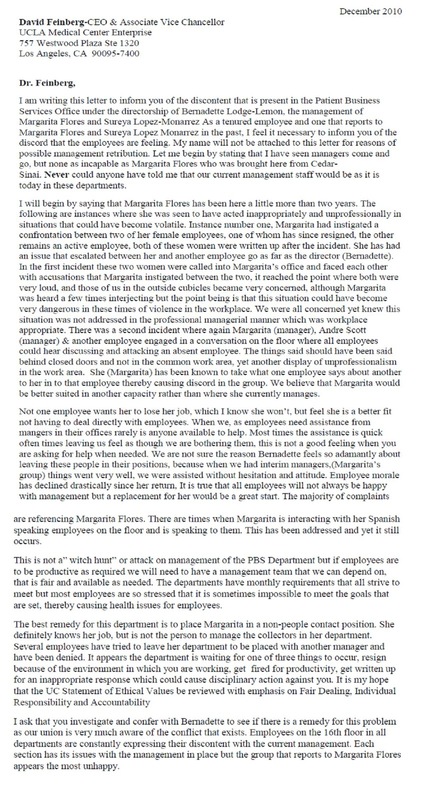 There was a second incident where again Margarita (manager), Andre Scott (manager) & another employee engaged in a conversation on the floor where all employees could hear discussing and attacking an absent employee. The things said should have been said behind closed doors and not in the common work area, yet another display of unprofessionalism in the work area. She (Margarita) has been known to take what one employee says about another to her in to that employee thereby causing discord in the group. We believe that Margarita would be better suited in another capacity rather than where she currently manages. Not one employee wants her to lose her job, which I know she won’t, but feel she is a better fit not having to deal directly with employees. When we, as employees need assistance from mangers in their offices rarely is anyone available to help. Most times the assistance is quick often times leaving us feel as though we are bothering them, this is not a good feeling when you are asking for help when needed. We are not sure the reason Bernadette feels so adamantly about leaving these people in their positions, because when we had interim managers,(Margarita’s group) things went very well, we were assisted without hesitation and attitude. Employee morale has declined drastically since her return, It is true that all employees will not always be happy with management but a replacement for her would be a great start. The majority of complaints are referencing Margarita Flores. There are times when Margarita is interacting with her Spanish speaking employees on the floor and is speaking to them. This has been addressed and yet it still occurs. This is not a” witch hunt” or attack on management of the PBS Department but if employees are to be productive as required we will need to have a management team that we can depend on, that is fair and available as needed. The departments have monthly requirements that all strive to meet but most employees are so stressed that it is sometimes impossible to meet the goals that are set, thereby causing health issues for employees. The best remedy for this department is to place Margarita in a non-people contact position. She definitely knows her job, but is not the person to manage the collectors in her department. Several employees have tried to leave her department to be placed with another manager and have been denied. It appears the department is waiting for one of three things to occur, resign because of the environment in which you are working, get fired for productivity, get written up for an inappropriate response which could cause disciplinary action against you. It is my hope that the UC Statement of Ethical Values be reviewed with emphasis on Fair Dealing, Individual Responsibility and Accountability. I ask that you investigate and confer with Bernadette to see if there is a remedy for this problem as our union is very much aware of the conflict that exists. Employees on the 16th floor in all departments are constantly expressing their discontent with the current management. Each section has its issues with the management in place but the group that reports to Margarita Flores appears the most unhappy. EDITOR’S NOTE: As of date of publishing this letter David Feinberg, UCLA Health System CEO have not responded or taking any action. Employees of the UCLA Health System Patient Business Service are reaching to us for help. We hope more employees will SPEAK UP and contact us. On Thursday, February 3, 2011 we received the following email attack from old lady name: Flanery, Barbara S.